My parents were older when I was born. When I was about seven years old, they had already been married 25 years! They decided to take a second honeymoon (even though they never had a FIRST honeymoon because of the war). They went to San Francisco and Hawaii, and were gone for three weeks. To babysit me, my grandmother Altenburg made the journey to Massachusetts from Illinois where she was living at the time, having just lost her husband, my grandfather, the year before, in 1966, which caused her to return to Illinois from Florida (if I have the story right). One day, Grandma and I were sitting on lawn chairs on Frost Street between the Mueller house and the McIntyre house, on a piece of land we called "The Village Green" watching traffic go by and getting some air. It was actually just part of our yard, but we kids liked to play there, and it was really cool. I kept hearing a sound. A sort of "ooo- ooo - oo" that seemed to occur every 15 seconds or so. I asked Grandma, "What is that? ", and mimicked the sound. "It's a mourning dove." explained Grandma. "But, it's afternoon." I replied, puzzled. Being an accomplished speller, I knew that morning was the time of day, and mourning was when people were sad. Fast forward 20 years, to approximately 1987. I was asleep at Long View Farm in the early morning hours with my sweetheart, Gil. Lying there looking up at the sky through the skylight over the bed, we groggily engaged in some pillow talk. A mourning dove started cooing. "oooo-ooo-ooo", every 15 seconds, like they do. "Listen to that owl." whispered Gil. "It's a mourning dove." I whispered back. "I thought it was an owl." "No, it's a mourning dove. They go, 'cooo -- ooo -oo'. Owls go oo-oo-ooo-OOO, and they come out at night, usually." Here I was, educating the great teacher! "Hmph. Thought it was an owl." he muttered. We went downstairs to have coffee in the kitchen. Some of the LVF staff were milling about. "I heard an owl." Gil told them. "It's a mourning dove." I sighed, and mimicked the "cooo-ooo-oo" thing. John Farrell said, "Yeah, that's a mourning dove." Geoff Myers agreed. Kent wasn't too sure. "Hmph. Could've sworn that was an owl." grumbled Gil, disappointedly, and left the room, summarily ending the discussion, as he often did. Fast forward 27 years to this morning. His sister on the west coast, and I here in Massachusetts, decided to have a sort of "moment of silence" type of thing for Gil at 9:00 a.m. to help his spirit travel well. I sat on the bedroom floor, where his bed used to be, alone, hugging one of his flannel shirts close to me, a candle lit, a bouquet of flowers from his sister having been delivered just moments before, and an old quartz crystal that belonged to his mother magically announcing itself from a nearby shelf. 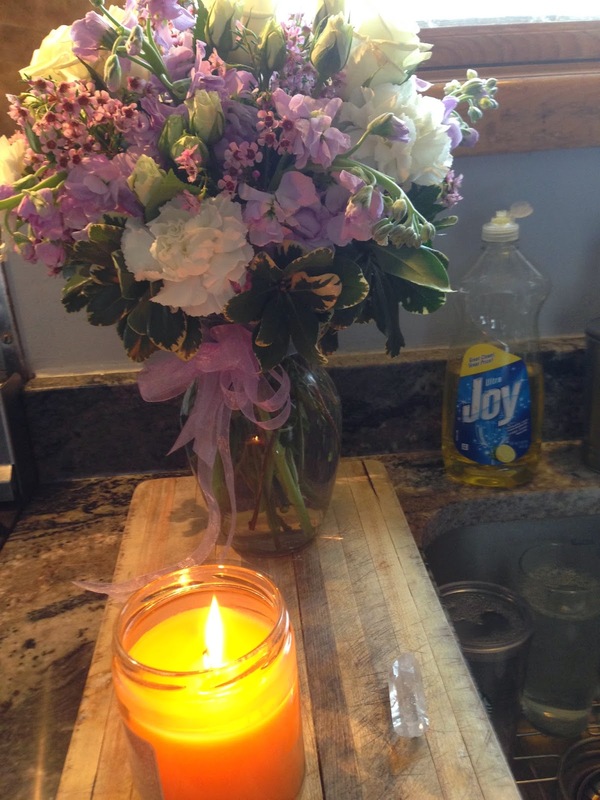 I placed the flowers, candle and crystal on Gil's favorite cutting board. "Bring me my board," he would say. It was the perfect place to set up a small altar for the ceremony. It was then that I heard the familiar "cooo-ooo-oo" outside the bedroom window. The first mourning dove of spring, 2015. A light rain is falling and the fog over the lake is thick. The dogs are unusually silent, for once. The cats are zooming around the house, playing with spirits, no doubt. Hobie is sound asleep. The neighborhood is quiet, except for the first birds of spring, chirping. The washing machine is humming its final load of Gil's laundry. And the mourning dove is singing her sweet cooing song. Very moving ... Reminds me of that final scene in Torch Song Trilogy, when he sits in the armchair with items from his loved ones, past and present. Hah! Didn't even think of that! You're right!! A friend passed away last year and we just had a cancer benefit for her. She was a beautiful soul. Always a smile and a positive word. She was only in her 40's. What stays with us all are some of her parting words... " don't be sad that it's over, be happy that it was". My children today celebrate one of their grandmother's birthdays and morn the loss of their other grandmother. Life is so bittersweet sometimes. Please know that you are in our prayers Kathy and may Gils wonderful soul shine bring you peace and comfort.